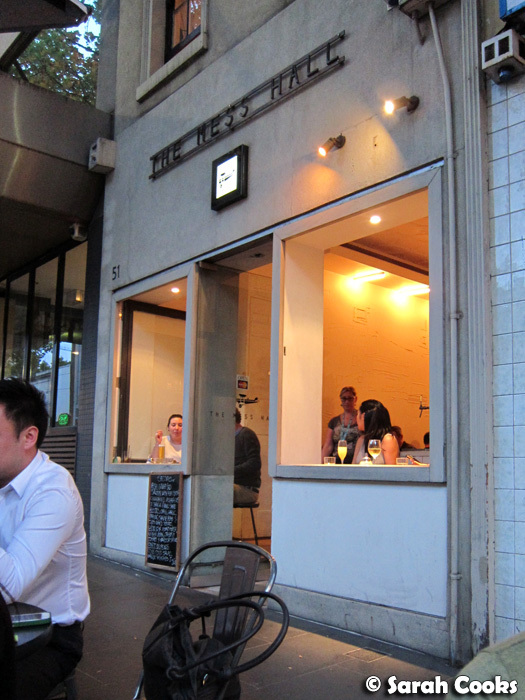 Up at the top end of Bourke Street, The Mess Hall is pretty nondescript. I must have walked past it dozens of times without noticing it, and the first time it caught my eye was out of sheer necessity. We'd just had dinner at nearby Shimbashi, followed by gelato at Spring Street Grocery. It was about 10 pm, and we weren't quite ready to call it a night, but definitely weren't up for hitting a nearby bar. (What can I say? I'm a grandma and sometimes even the notion of a nightclub or even a quiet cocktail bar is just too exhausting to contemplate!) We just wanted somewhere warm where we could sit and keep chatting. The Mess Hall was open and had a free table - success! I felt a bit self conscious just ordering hot drinks, and checked with a waitress if it would be okay before we sat down, but there was no problem at all. Even though the four of us literally only ordered a cup of tea each, the staff were really friendly and super-chilled. So nice of them! The plates of food being delivered to nearby tables looked and smelled fantastic too, so we decided that we simply must come back and try their food. And that's exactly what we did a couple of weeks ago on a Friday night! Cheers to the weekend! A Campari soda was the tipple of choice for both Adrian and myself - although it was pretty funny, one came out obviously stronger (i.e. much redder) than the other... no idea why! We actually swapped after the first couple of sips because Adrian got the stronger one and found it too bitter, and I was dissatisfied with my insipid one. 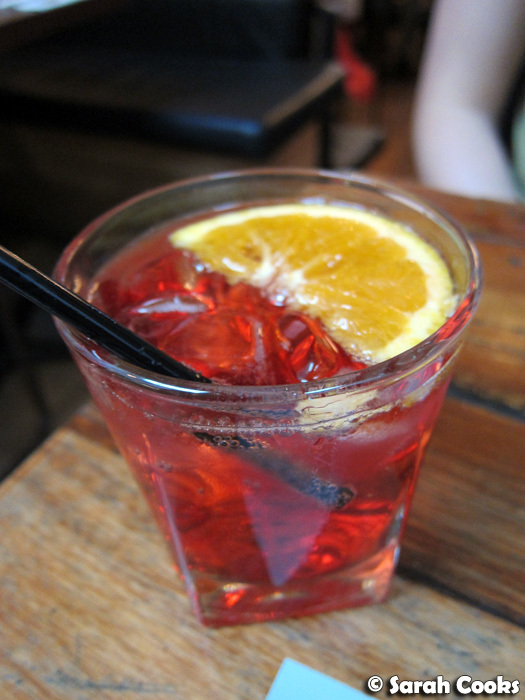 I want ALL OF THE CAMPARI! Being super indecisive, we spent ages umming and ah-ing over the menu, which is a concise list comprising a few starters, some pizzas, pastas, salads and three "main plates", but all ended up choosing pasta or risotto. I actually threw out the receipt before writing up this post, and the menu online seems to be a bit out of date, so I don't have exact prices for the dishes, but the pastas and risotto were all around the $22 mark, and the dessert was about $11. No surprise, I went for the dish that had pumpkin, burnt butter and sage. I know that it's classic to crush sweet amaretti biscuits over this type of dish, but I'd never tried it before. Newsflash: it's amazing. 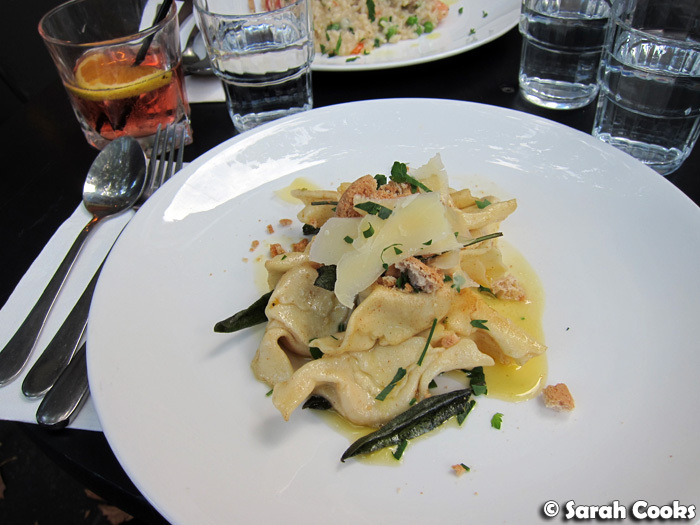 The pasta parcels were filled with soft, sweet pumpkin, and I loved the nutty burnt butter and the herbal hit of the crisp sage. Even though I only tried one spoon of the risotto, I was really impressed by it. The rice was perfectly cooked, and had a wonderful rich seafood aroma, and was generously studded with prawns and shrimps. (The specials board, intriguingly, listed "prawns" and "shrimp" as separate ingredients). 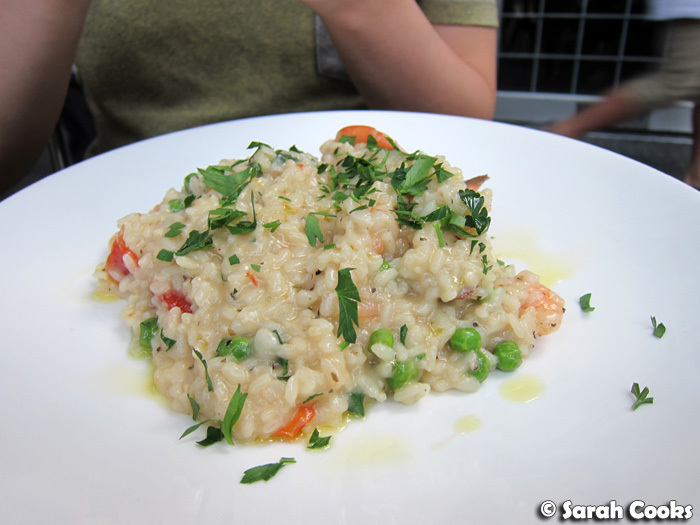 It can be hard to find a good risotto around town - there are many good ones, but also many very bad ones, and I'm especially wary of seafood risottos - but this was excellent. I highly recommend it if it's on the specials board! 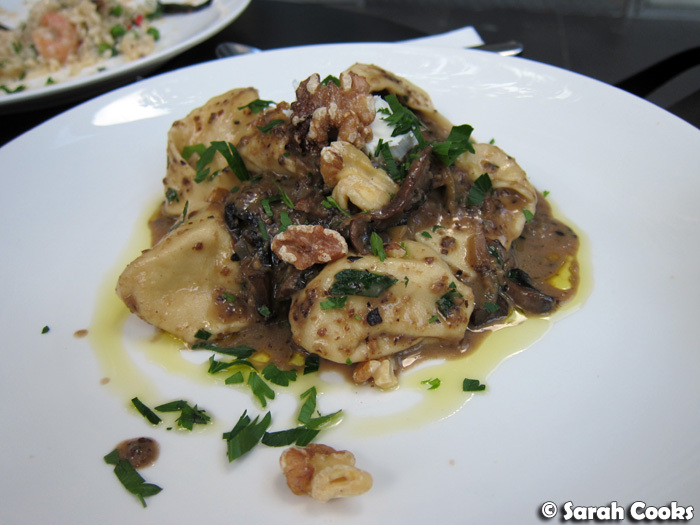 Sandra's chicken, ricotta and walnut tortellini was also a winner. The tortellini themselves were generously sized, and the mushroom sauce was quite intense, but in a pleasant, rather than overpowering way. The walnuts seemed to be an unusual addition (perhaps common in Italy, but not one that I see too often here), but fit in really well with the dish, providing both flavour and texture. This also reminds me that I really must try making that pasta with walnut sauce that Nigella made on one of her Christmas specials many years ago! The only letdown was dessert - we shared a piece of orange chiffon cake, and whilst it was pretty nice (moist, and with lots of nice pieces of candied orange), it felt a bit small for something that cost over ten dollars. 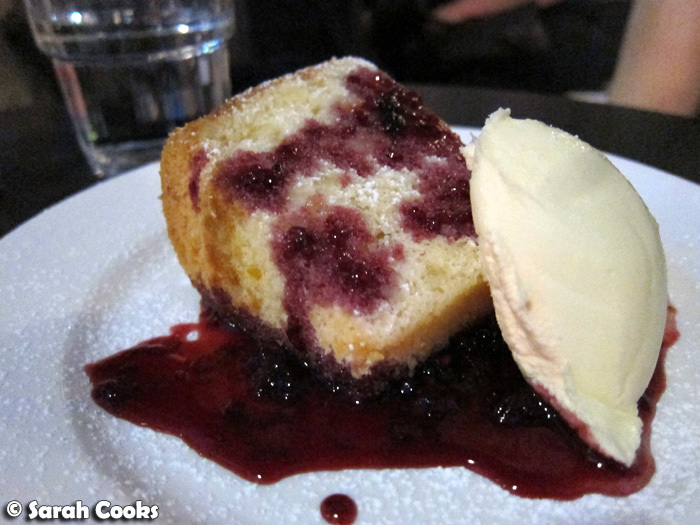 Despite the dessert, we really liked The Mess Hall - they serve well made, tasty and unpretentious food in a relaxed yet buzzy environment. I'd definitely want to go back! Whilst the risotto and pastas we tried were indeed, very good, we saw a few plates of their pork belly dish being ferried around and it looked and smelled incredible! Hannah - unless of course, that dessert is made with orange and champagne... and is a drink. I walk pass there quite a bit and have never entered. But it does look so cool and hipster ... want spring st grocer! Lorraine - Ah, a fellow grandma! Yay!! The food here was totally rad. Loved the risotto. We must go back again!